One of my first jobs out of journalism school was writing advertorials for a Chicago suburban newspaper chain called the Pioneer Press. I got paid 10 cents a word (a thief’s ransom by today’s editorial wages) to write what amounted to ad copy that disguised itself as news features. There was an article for a local funeral home on their connection to the community. There was a profile piece on a local flower shop. It might not have been Walter Cronkite-caliber reporting, but it paid the bills. At that time, newspapers still held journalism ethics as sacrosanct. The divide between business and editorial was a bright line that should never be crossed. That’s why all my doggy daycare and jewelry store copy was always prominently labeled with the words “Advertorial” at the top of every page. The day of the classic advertorial is gone. Sure, they still exist in various pay-to-play venues, where companies shell out a fee in exchange for an open space in which they can couch whatever promotional message they see fit in a thinly transparent guise of news. But audiences have grown savvier over the years, and these kinds of blatant attempts at not-so-subtle online marketing just don’t cut it like they used to. Native advertising is the term given to paid content that not only takes on the appearance of editorial copy, but also conforms to the voice and style of the publication. (You can view some examples here and here, latter of which is an entire section of content paid for in part by Unilever.) While this might seem like an inconsequential difference from advertorials, the tactic raises a number of important questions for marketers and the media alike. Native advertising has been a force in Internet marketing circles for a few years, one that has begun to gain tremendous momentum as of late. 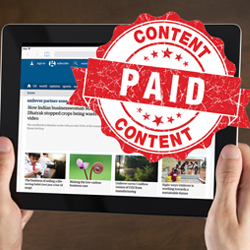 In fact, it’s believed that 75 percent of publishers offer some form of native advertising on their platforms. This includes CNN, which just announced in June that it is opening up an entire in-house studio dedicated solely to producing news-like content on behalf of advertisers. Native advertising has shown to be the new banner advertisement. It’s no secret that Internet banner ads – those annoying paid placements that flash in your periphery – have diminished returns. Because they are so ubiquitous and so irrelevant to most Internet users, consumers are literally blind to them. And, while online banner ads have shown to foster brand loyalty among 23 percent of site visitors, native ads claim to have an effect on 32 percent of site visitors, according to statistics released by MDG Advertising. The same data set shows that native advertising also increases purchase intent more than banner ads by 18 percent. While native advertising has not yet become a central focus for the legal industry, marketers as a whole are taking advantage of native ads in large numbers. In fact, Buzzfeed – the website that popularized the use of the list-based article – has had more than 700 advertisers take advantage ofuse its native advertising opportunities. As noted above, there appear to be concrete benefits for brands that take advantage of native advertising. Native ads create “buzz” by posing as interesting content that, ideally, gets shared far and wide across the Internet through social media. Native ads also don’t feel like traditional advertising and are camouflaged in a way to be more appealing to a specific audience’s readership. And native ads help promote awareness of a brand, cultivate brand loyalty and help drive sales decisions. Publishers also stand to benefit from native ads. The same MGD Advertising infographic states that 20 percent of Forbes’s 2013 revenue came from its native advertising platform. According to a study by content agency Relevance, the average cost of a native ad campaign with a top-tier publisher is more than $54,000. Time magazine alone charges up to $200,000 for a single native ad placement. That said, lower-tier publications are much more affordable and in line with law firm marketing budgets, with prices trending as low as less than $100 per ad. While there appear to be benefits to native advertising, as with any new marketing tactic, we have to ask: Is this too good to be true? The tool is still in its relative infancy, particularly among the legal marketing crowd. Speaking as Jaffe’s Content Strategist, I see a road rife with trouble. First, as much as I try to shake it, I still feel like a journalist trapped inside a marketer’s body. Journalism was my first love and my area of study. It was my profession before I “jumped the fence” into PR and marketing. And, so I get a little queasy when we start talking about blurring the lines between editorial and advertising. There really is no brighter red flag than violating this sacred tenet. Anytime the influence of money colors editorial content, the credibility of the outlet is called into question. This is incredibly damaging to the publication, as all that it has to its name is its credibility. If information cannot be believed, there is no reason for anyone to read the outlet in the first place. Once trust is violated, some readers will tune out. In addition, as readers tune out, the ROI of a native advertising opportunity on the site diminishes, as the whole point of native advertising is to blend seamlessly into a site’s editorial content to capitalize on an outlet’s built-in readership and the pre-existing brand loyalty it has with its audience. No readership – and particularly no trusting readership – and you can see how the native advertising spot becomes less appealing. Furthermore, if readers suspect that a brand is trying to “dupe” the readership, they might have negative sentiments toward the brand. After all, nobody likes to feel deceived. This topic of native advertising as deception was part of a study by the Reuters Institute for the Study of Journalism. According to their research, 43 percent of readers of U.S. news sites have felt disappointed or deceived after reading content they later discovered was native advertising. The same study reported that 22 percent of U.S. readers had a less positive view of the brand that paid for the advertisement. As a legal marketer with a background in journalism, I’m torn. On one hand, I am not a fan of any form of law firm advertising that tries to mimic actual news content because of the questionable ethical violations it poses and the damage it could have on the social good. However, it’s not going away, it’s becoming a major revenue stream for publications that have suffered greatly economically, and, well, everybody is doing it. There are ethical implications for law firms that engage in native advertising. All law firm web marketing must comply with the applicable state bar guidelines, and native advertising certainly presents challenges in terms of ensuring ads are clearly indicated as such. That said, publications are continually working on schemes to ensure readers are aware that what they are reading is sponsored content versus editorial content. So it could be that this becomes moot as media native advertising best practices continue to take shape. Regardless, any legal marketer investigating a native advertising opportunity should negotiate with the publication to see what can be done to ensure the content and style of the native advertisement does not violate any bar ethics rules. Beyond the ethical implications, law firms need to select their native advertising targets carefully. Just as placing any advertisement requires thorough research to ensure that the ad’s placement accomplishes its intended goal, this is especially true for native advertising. Because the content is reflective of the voice and tone of the outlet as opposed to the law firm’s brand, you have to identify a publication whose identity and/or readership closely aligns with your own. Whether native advertising becomes a viable marketing tool for the legal industry remains to be seen. We’ll continue to monitor this emerging area to better understand how it can be leveraged for the benefit of law firms. In the meantime, if you have any questions regarding native advertising or any other area of content marketing, feel free to contact Terry M. Isner at tisner@jaffepr.com.